When surgery is required on the foot, ankle, or lower leg, you want to have the knowledge and confidence that those who will be performing such an important procedure are not only qualified to do the job, but rather, possess the skill, experience, expertise and understanding required to perform flawlessly. At Cherrywood Foot Care, foot surgery, of all types, is our specialty. We pride ourselves on the caliber of our staff, the professionalism of our services, and the well-being of our patients. People like you. People who depend on us. Whether it be a painful sprain or a nasty fracture, we know the best way to treat it. Arthritis or joint disease? Benign and malignant tumors? Bunions? The conditions requiring surgery run the gamut. From calluses, corns and warts to hammertoes, flatfeet and toe spurs, Cherrywood has you covered. We know the best cure, the best protocol, the best remedy. And we know how to make you comfortable, because we’re also aware that oftentimes, it’s the moments leading up to the surgery that can be the most nerve-wracking, add the most stress. 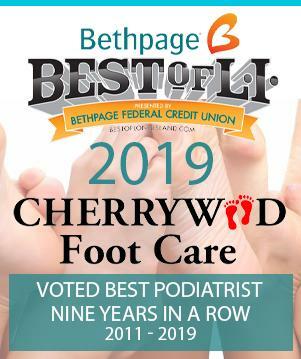 At Cherrywood Foot Care, we believe that the podiatrist’s job doesn’t just begin and end during an examination or with a surgery. True foot health is inextricable from true overall health, and that includes a healthy state of mind. Cherrywood gives patients that healthy piece of mind. And as our legions of patients can attest, that goes a long, long way. Our team walks you through the process, answering any questions, addressing any concerns, and informing you all along the way. Typically, many foot and ankle surgeries include use of a local anesthetic. Most foot surgeries require a period of immobilization, post-procedure, with protective orthotic aids, including bandages, splints, casts, surgical shoes or open sandals. There are usually important guidelines that must also be adhered to following the surgery, such as limited mobility or complete immobilization, restrictions on lifting and weight-bearing activities, elevation and icing of the foot, and/or keeping the affected area dry for a period of time. Additional post-surgical requirements may include therapy, physiotherapy, orthotic devices or even special footwear. We will talk about all this. We will walk you through it all. We will get you back up on your feet again and walking, with your head held high. Our name contains our motto. At Cherrywood Foot Care, we care, about you.